Enjoy the mouth-watering stuffed Brinjals (eggplant) as a main course item with your loved ones! Wash and slit Brinjals. Remove the tops. Put the Brinjals in salted water. Fry coconut, Bengal gram dal, udad dal, red chillies, fenugreek seeds, cumin seeds, and mustard seeds in a little oil. Grind the fried mixture with tamarind, stevia powder, and salt to a fine paste. Add a little water at the time of grinding. 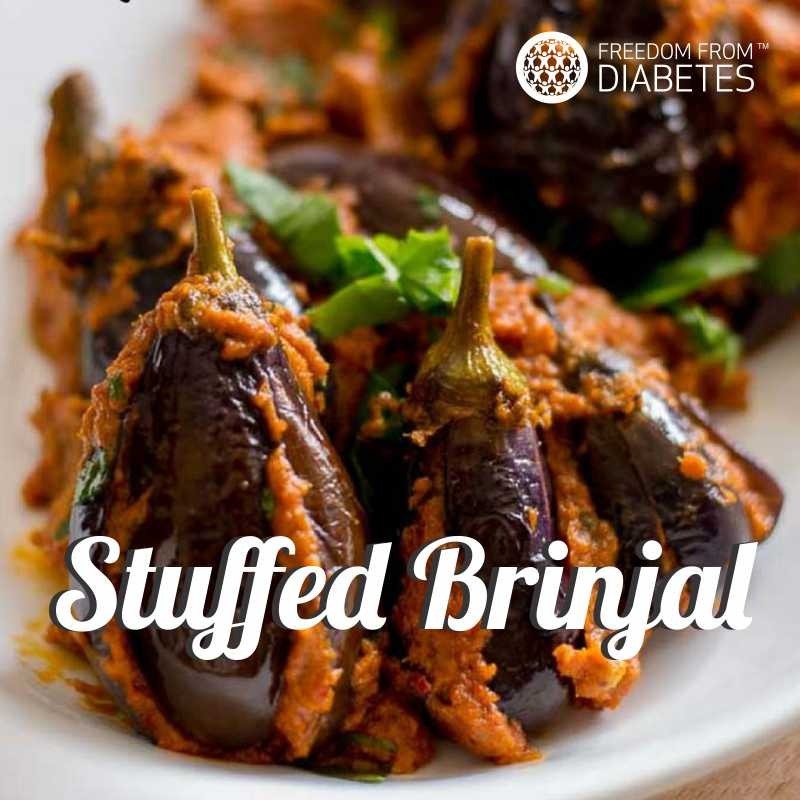 Stuff this masala in Brinjals. (Reserve any leftover masala) Heat oil in a thick kadhai. Put mustard seeds in oil and, when they splutter, add curry leaves and turmeric powder. Place all the stuffed Brinjals one by one in the pan. Cover and cook for 5-6 mins. Now turn the Brinjals. Add water to the remaining masala (if any) and mix well. Pour the masala on the Brinjals and mix well. Do not cover. Cook until done. Garnish with chopped coriander leaves. FREEDOM FROM DIABETES unique BASIC PROGRAM is scheduled in Navi Mumbai & Thane on 28 October 2018. ⭐ A proven, scientifically researched, holistic approach to better health. ⭐ 6000+ Diabetics already free from Medicine & Insulin. ⭐ Also helps to reduce weight, reduce or stop cholesterol, hypertension, thyroid medications, stress management & improve overall fitness and well-being. Near Sacred heart High School. Venue: Panini Sabhagriha, VPM's Thane college campus, Nr. Cidco Bus Stop, Chendani Thane West. 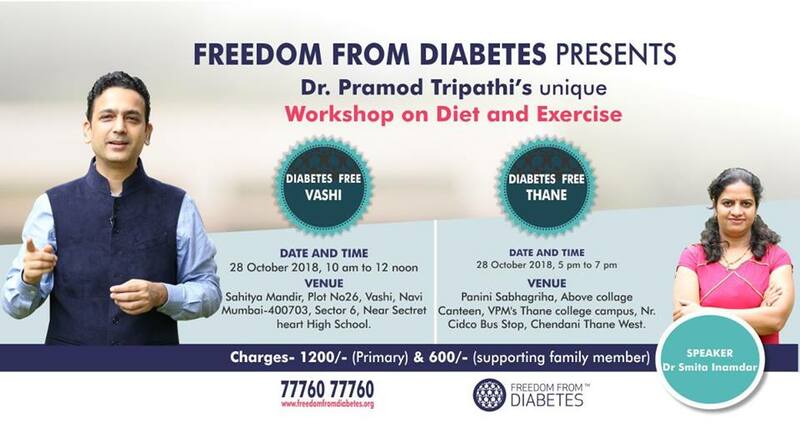 Charges: ₹ 1200/- For Diabetic/ Primary participant. ₹ 600/- For accompanying the IMMEDIATE family member. Why everyone should attend this seven days TRP? Lost 12 kg weight in 5 months. 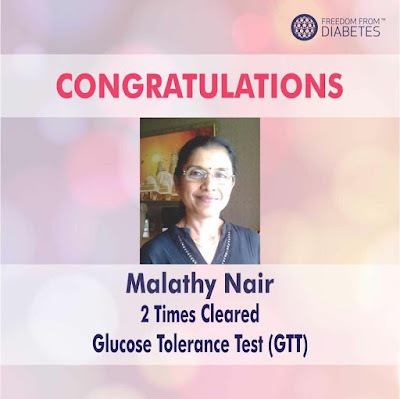 Hello, my name is Malathy Nair, age 64 years from Mumbai. I was diagnosed with diabetes in 2017. On joining FFD, the next day itself my allopathic tablet stopped. The 7 days experience with Dr. Pramod Tripathi and Team was really a special learning for me. I could gain not only about diabetic treatment but also about daily diet, yoga, exercise, dance, a wonderful awareness of life's various disciplines. I was thinking that I should have joined FFD much earlier. I recommend FFD not only for diabetics, but for every single individual who wants to live a beautiful and healthy life. I feel everyone should at least once attend this 7 days programme to experience a dazzling experience of change in their lives and health conditions. After I was off from my diabetes tablets, I felt like I was never a diabetic in my life. I have also passed GTT. I reduced 12 kg weight, no BP, no cholesterol, no problems! I continued smoothie and my diabetes never come back. I ate lots of mangoes, jackfruit, sometimes ice-cream, cake, sweet, toffee, payasam (kheer), etc. Now again for the 2nd time I have cleared the GTT. Today at 64, I feel as energetic as my 40s. I suggest and request everyone to please attend the wonderful 7 days FFD course for your own benefit!! While returning from Hidden Oasis, I can feel it that I have changed a lot over time. Mentally and spiritually also. My mind is very cool and calm now, my attitude has changed and I am completely stress free!! 6500+ Diabetics already Free from Medicine & Insulin. Also helps to reduce weight, reduce or stop cholesterol, hypertension, thyroid medications, stress management & improve overall fitness and well-being! INSIGHTFUL INFORMATION: Walnuts are part of the tree nut family! They have the property of high antioxidant content leading to improving the blood vessel function and fight with the radicals. They provide variety of health benefits and reduce the chance of developing type 2 diabetes in adults. They are rich source of protein, vitamin E, as well as minerals such as calcium, magnesium, potassium, chromium, and zinc. 1⃣ Walnuts are an excellent source of antioxidants that can help fight oxidative damage in your body, including damage due to “bad” LDL cholesterol, which promotes atherosclerosis. 2⃣ Walnuts are a good source of the plant form of omega-3 fat, which may help reduce heart disease risk. 3⃣ The polyphenols in walnuts may reduce your risk of certain cancers, including breast, prostate and colorectal cancers. 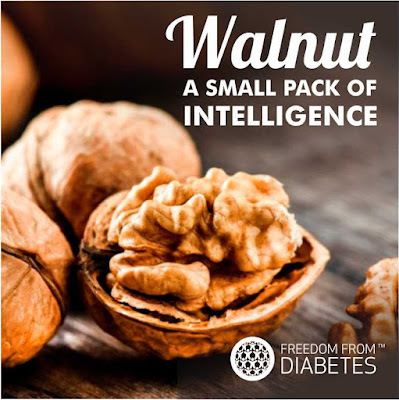 4⃣ Eating walnuts may help control type 2 diabetes and reduce your risk of the disease, as it contains chromium. 5⃣ Walnuts contain nutrients that may help protect your brain from damaging inflammation and support good brain function as you age. 6⃣ It also boosts bone health. They increase calcium absorption and deposition while reducing urinary calcium excretion. 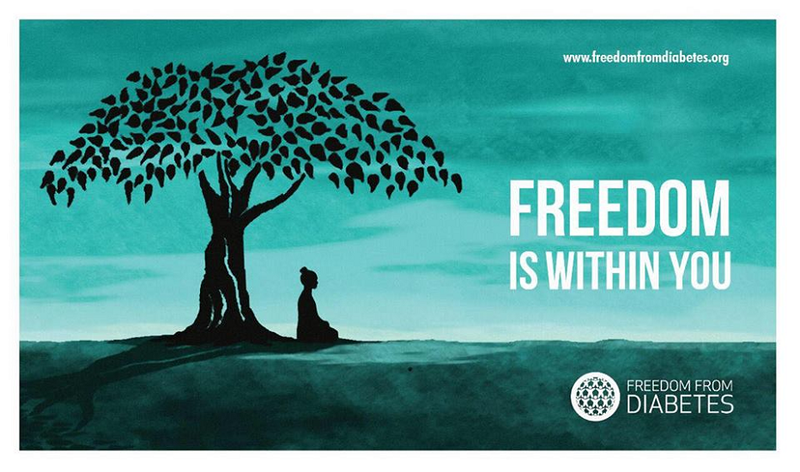 Muktotsav; a celebration of Freedom! 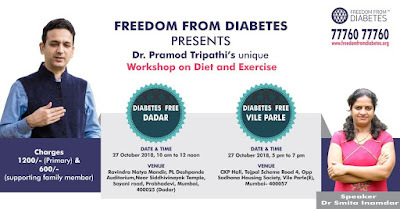 Freedom From Diabetes..! This year we held the Muktotsav on 29 September 2018, at Pune; with over 1,500 people witnessing the event live..! Freedom From Diabetes welcomes you to witness the celebration of freedom at Muktotsav 2018! 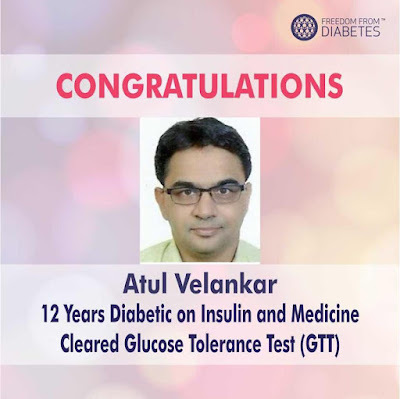 Celebrating the victory of our 125 champions who cleared the Glucose Tolerance Test (GTT) and Impaired Glucose Tolerance Test (IGT). A big congratulations to those who cleared the tests and Best Of Luck for those who are lined up for next year! My name is Atul Velankar, age 46 years. I am from Mumbai. I had diabetes since 12+ years. Before joining FFD, I used to take 3 tablets and 38 units of Insulin. I surprisingly became free in flat 19 days. I was weighing over 75 Kgs which has now reduced to 58 Kgs. Most important change is NOT the "freedom from Diabetes". But freedom from "FEAR OF DIABETES". Every doctor I met in the past was resoundingly talking about "disease until I die" and consistent increase in medicines. Now, I know that diabetes is not going to go away and always will be around the corner. Perhaps I have done lot of injustice to my body and mind, and diabetes is indeed a result of it. It would be naive to think, it has gone away in 3 weeks. However, I also know how to keep it off even if it comes back pushing. The most important difference is, I am no more afraid of it coming back.I know now, how to push it away even if it does come back. FFD is a strict regime, and I actually left my sales job, which made me travel all across India and South East Asia, work 18 hours a day with no timing for sleep, and food was my everyday schedule, but I went the FFD way and that is where the changes started happening and that though is few days. I got another job of course after 3 months, but that was worth. I have now bought at least 10-15 years of healthy life at cost of 3 months of job and also a weapon to keep diabetes monster away. (FFD regime). It is no secret that you can control diabetes. However, lot of people come to you recommending you about "what to eat - what not to eat, which exercise is good etc." However, they do not give conviction through proper reasoning. FFD told me proper reasoning of how my body behaves and if there is any recommendation on what to-do and not to do; it always came with reasoning (and how Dr. Tripathi and his team came to that conclusion of recommendation). Which also allows me to "experiment" on my body (which I am doing now a lot and not afraid of occasional sugar level increase at all due to that)! Now, that's what I call as freedom. It is not about "can I eat normal (?) food again" . It is now about... "I know how certain type of food, and I now also know how to put wrong away even if I consume". I have graduated to my understanding and my own rule through experiments that - If you eat anything (read sugar) today; just consume/drain it out from body today! No residing extra sugar when you go to sleep in the night. If you follow that - you are balanced. If you know you can work it out today.. eat it out now.. If you know you can't work it out... just don't eat! Simple... Isn't it? I thank the entire FFD team to educate me about my own body and guiding me with the right way to maintain myself..! 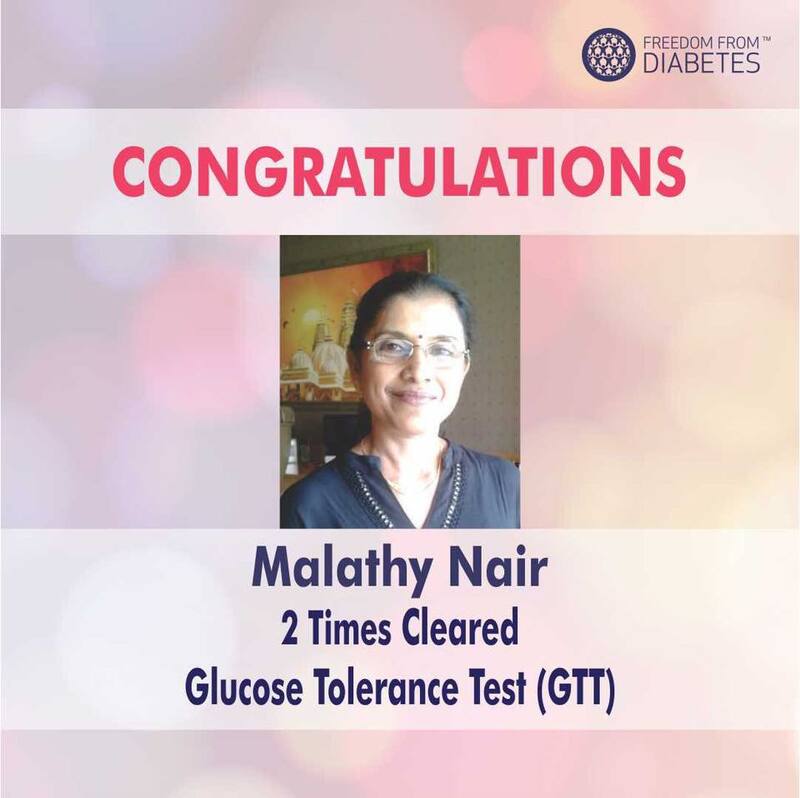 In the month of September, I appeared for the Glucose Tolerance Test (GTT) and am very happy to share that I have cleared it.